We are putting the next release of Pointwise through our maintenance release quality assurance process so it should be available soon. In Version 17.2 R2 you will get twice the performance out of T-Rex's (anisotropic tetrahedral extrusion) new hexahedral layer capability. And even though V17.2 R2 is not even out the door, the overset grid assembly features for V17.3 are finally settled and ready for pre-release testing. 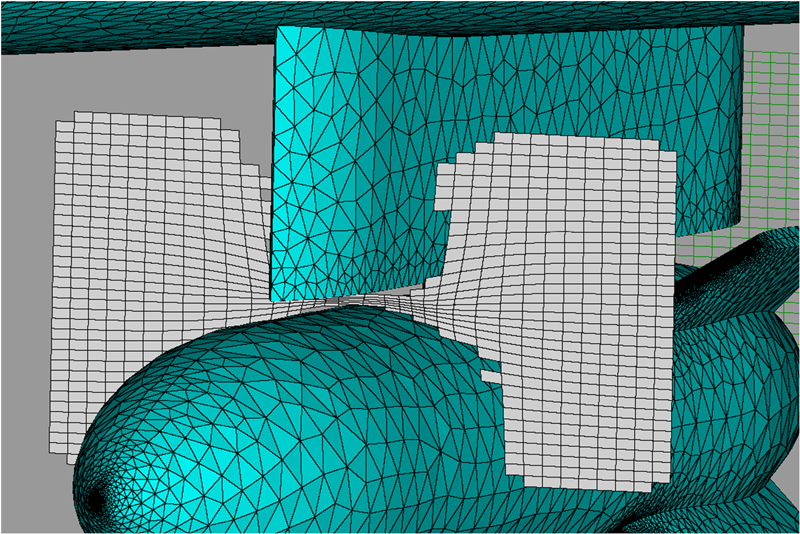 Looking further ahead along our roadmap, we have already begun laying the groundwork for the broadest expansion of Pointwise's meshing capabilities in the history of the company. Building on the new software architecture designed into the Pointwise product, you will soon be able to create the type of meshes in Version 18 that you never could before. In this second revision of V17.2, you will find a major update to T-Rex's hex layer capabilities first introduced in V17.2 R1. Recall that T-Rex works by extruding layers of anisotropic tetahedra and then agglomerating stacks of tetrahedra into prisms or hexes. Several benefits were achieved by changing how the agglomeration algorithm handles the first layer of hexahedra coming off a quad surface. The change reduced the number of mesh cells on the extrusion front with a corresponding reduction in run time for hex layer extrusion. For our test suite as a whole, the reduction in run time was 33 percent. The change introduced a simpler, less dense mesh topology on the extrusion front which in turn makes the extrusion more robust. This manifests itself as an increase in the number of hex and prism cells created in the near-wall layers. This increase was in the range 7-17 percent for our test suite. Third, the simpler mesh topology and increased cells in the near-wall layers resulted in a 29 percent drop in the number of isotropic tetrahedra in the farfield region for our test suite. Figure 1 shows cuts through a hybrid mesh generated by the updated T-Rex for the NASA CRM For this particular mesh the time required to generate the anisotropic cells was reduced by 46 percent, the number of agglomerated cells increased 15 percent, and the total number of cells for the overall mesh was reduced by 20 percent relative to the previous version of T-Rex. 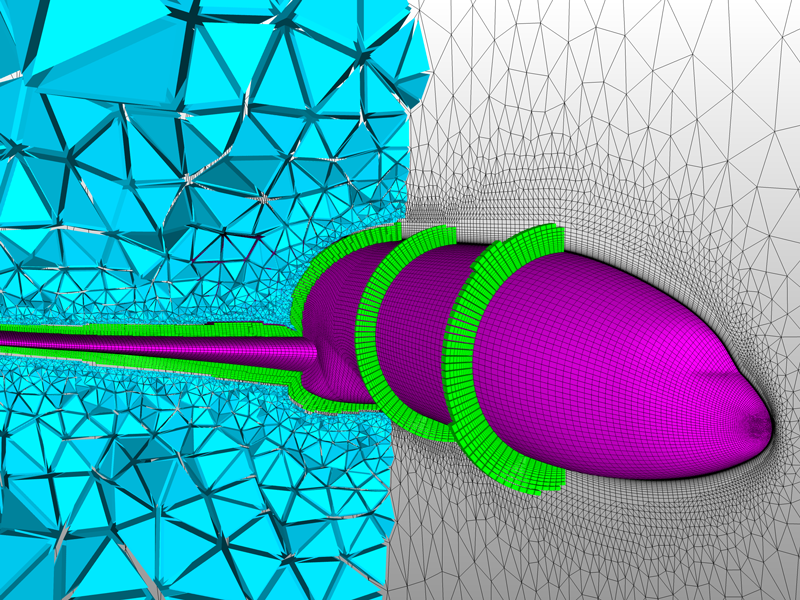 Figure 1: These cuts through a T-Rex hybrid mesh for NASA's CRM show the quad surface mesh (pink), hex layers (green), the transition to isotropic tets (cyan) and the symmetry plane (gray). Align View to Surface: The orientation of view in the Display window can be aligned with the normal vector of any selected surface. Also, view transitions to saved orientations can now be animated. Figure 2: By selecting a surface point or entering numeric values, you can align the view so that you're looking down that normal vector. Updated CAD File Readers: In addition to implementing the latest libraries from CT Core Technologies, our CAD interoperability partner, the reader has been implemented as a separate process for improved robustness. Drawing Guide: A drawing guide consisting of an array of vertical and horizontal lines can be overlayed on the Display window as a visual aid for aligning points on the screen for various operations. Also, the option to disable snapping to a selected point (previously available only in the Tweak command) has been added to all other commands that use the 3D point placement tools. Figure 3: The user-customizable Drawing Guide is a handy reference for aligning points when drawing in 3D. Project Distribution: You now have the option of projecting only a connector's shape while retaining its distribution attributes. Figure 4: Avoid connectors with “general” point distributions by projecting only the shape and preserving the distribution function and spacing constraints. Save Selection: Using the Save Selection As command, selected entities (and all other entities on which they depend) can be written to a new PW project file. With the Save Environment As command, all your settings – defaults, layers, properties, views, saved examine cuts, etc. but no entities – can be written to a PW file for loading at the beginning of a new project. Scripted Entity Selection: Two new Glyph commands give you more control over entity selection. One command returns a list of the currently selected entities. The other lets you specify which entities are selected upon script termination. 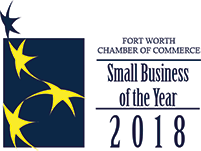 As you are probably aware, in 2013 we completed work on a two-year Small Business Innovation Research (SBIR) contract (U.S. Air Force, Arnold Engineering Development Complex, Air Force Materiel Command), during which we added to Pointwise the ability to set up, execute, and visualize overset grid assembly. This work was an extension of a previous six-month contract that resulted in a similar, but smaller, feature set in Gridgen. This research code has now been fully integrated into the production version of Pointwise and is on target for release in V17.3. Those of you who are using or would like to use overset grids will find that the overset grid assembly (OGA) process is now much more streamlined. Figure 5: Visualizing how grids overlap provides a guide for remeshing. We do not yet have a release date for Version 17.3. Figure 6: In this example of overlap remediation by adaption, the background Cartesian grid has been adapted into the gap between the pylon and store. T-Rex hybrid meshes with the near-wall prism or hex layers are created as a post-processing step from the original, extruded, anisotropic tetrahedra. In other words, Pointwise stores T-Rex meshes in their original, all-tet form. Imagine if the code was accommodating of more mesh types. 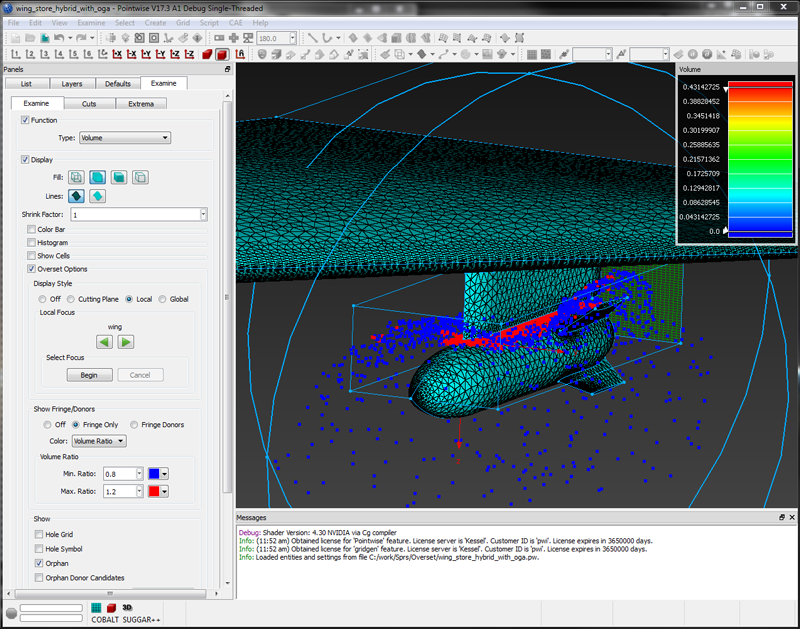 The years of work that went in to the development of the Pointwise product – Version 16 in 2007 and Version 17 in 2012 – were focused on improving user experience while keeping the meshing capabilities more or less intact. However, behind the scenes we built a new core infrastructure that gives us much more flexibility to broaden our mesh support. With Version 18, you will see the payoffs of that new architecture through an expanded menu of supported mesh types. Generate an unstructured quad or quad dominant surface mesh and grow hex layers off of it using T-Rex. Save your hybrid mesh with the full mix of cell types so that you can verify the mesh quality prior to exporting it for your flow solver. Imagine what other capabilities this new flexibility will offer. If you want to hear – and more importantly, see – the details of these new developments, please join us at the Pointwise User Group Meeting 2014 coming up on 29-30 October in Anaheim, California. You'll see our imagination at work.